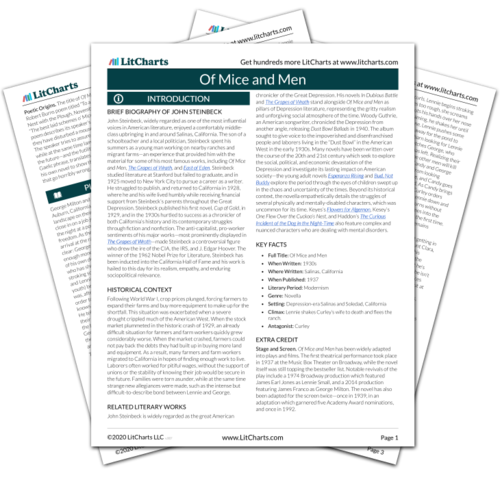 LitCharts assigns a color and icon to each theme in Of Mice and Men, which you can use to track the themes throughout the work. Hiding in the brush by the river, Lennie has a vision of his Aunt Clara, who tells him George would have had a much easier life without him. Lennie then has a hallucination of a giant rabbit, which tells him George will abandon him. Lennie understands the destructive consequences of his actions on his friendship and dream. The things he holds most dear condemn him. George shows up. He is quiet and not angry. Lennie begs George to yell at him. George does, but he shows no real anger. Lennie offers to go live in a cave, and George, as usual, tells him not to. In this terrible moment, Lennie wants to act as if everything is normal. George plays along. Lennie then asks George to describe their farm. George does, and tells Lennie to take off his hat and to look out over the river and try to imagine the farm. As Lennie happily says they should buy the farm now, George lifts Carlson's gun and shoots Lennie in the back of the head. George takes Candy's advice: he makes sure Lennie dies at the hand of someone he loves while imagining the unattainable dream that made his life meaningful. The other men hear the gun shot. George tells Carlson that Lennie had his gun and that he shot him after wrestling it away from him. Slim leads the distraught George away, repeating over and over that George had to do it. Carlson and Curley can't figure out what's "eatin'" George and Slim. Men like Carlson and Curley have no understanding of the friendship that can exist between men. Slim and George do, because of Lennie. That is the legacy of Lennie's dream. Lichtenstein, Jesse. "Of Mice and Men Part 6." LitCharts. LitCharts LLC, 22 Jul 2013. Web. 7 Dec 2018. Lichtenstein, Jesse. "Of Mice and Men Part 6." LitCharts LLC, July 22, 2013. 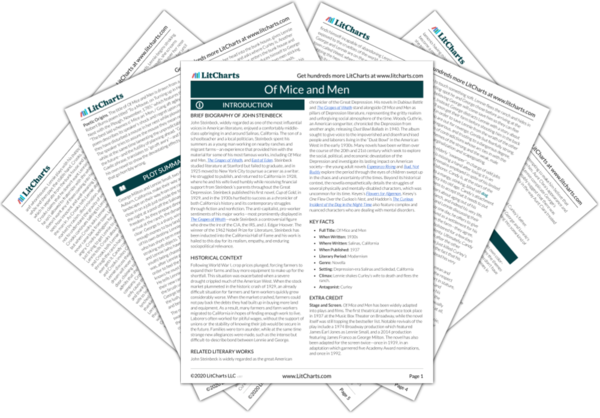 Retrieved December 7, 2018. https://www.litcharts.com/lit/of-mice-and-men/part-6.